I purchased one precious skein of Bugga from Cephalopod Yarns, one of the new companies that rose from the demise of The Sanguine Gryphon. I couldn’t help myself. Look at it! Pale teal-ish baby blues and bright yellow-ish spring greens… it was made for me. Truly. 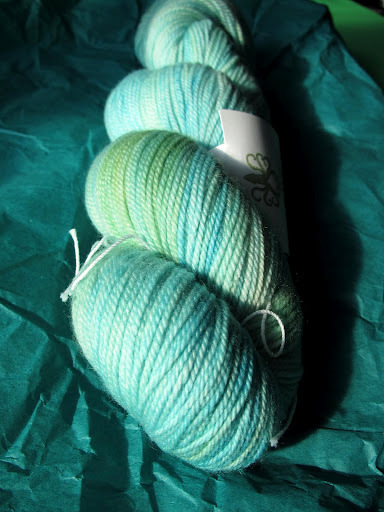 I rationalized it by selling over $200 worth of other SG yarn from my stash, plus it was my birthday and all that. That makes it better, right? 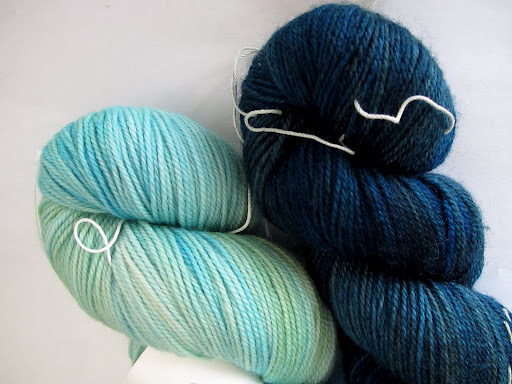 Also, I needed it to pair with my skein of Bugga in Box Jellyfish in a Flamboyan shawl. It will be the most glorious shawl in all the land. Thus, I simply don’t regret my lack of resolve. I’m too excited to wind these babies up and cast on! That’s what I’ve got to look forward to this weekend, in addition to a visit to Medieval Manor near Boston. What’s going on in your neck of the woods? Whatever it is, hope it’s happy! This entry was posted in Bugga, yarnaholic by shoelaceswitcher. Bookmark the permalink.